Update: I just found a ton of JIRAs for issues related to the same issues I was having, so this bug is more widespread than I thought, and not just Mac centric. The newest Firestorm beta has just been released that also contains this bug, so this might start effecting lots of people. Symptoms can vary, such as TP’s fail or crash you, friends list never loads, (shows loading) you can’t IM someone (but they can IM you) you can’t open profiles, groups do wierd things, can’t see or upload mesh or can’t edit objects or have trouble creating objects or saving objects. It can seem like you aren’t fully connected to the grid. See the instructions below to change your DNS to Google’s as a workaround so you can continue to enjoy SL while they work on fixing the bug. I see quite a few people complaining on Plurk that the official Second Life Viewer2/Viewer3 is very laggy for them. This may help, it’s worth a shot. And it might improve your internet speed overall (or so I read, if that’s wrong and you know better, chime in). I was having some DNS related bugs on the newer set of viewers 2.7 and above, and the workaround is setting my DNS to use Google’s DNS. My original problems seemed to be more Mac centric, though there were some Vista users. BUT! whatever the DNS related bugs, it could be affecting other people in different ways. So, worth a shot I think? This, very much so. I had this exact issue with Viewer 3 (and the new Firestorm based on it.) Meanwhile, older copies of Firestorm worked just fine. Swapping DNS servers solved the problem right up. Thank you so much. I’ve been unable to use Firestorm mesh since the beta was released, and though people on Phoenix/Firestorm support group tried to help, I haven’t seen a solution yet. This worked like a dream. don’t really understand this dns stuff, i actually went looking for it in prefs in the viewer rather than on my mac!! have i changed this for all the internet or added an option for second life? It does change your connection to the entire Internet, but there’s nothing bad about using the free Google DNS. It’s reportedly better than most people’s ISP’s DNS service (which is what you use by default unless you change it) I know personally our old ISP’s DNS gave us major problems; our current DNS was working pretty good except for this SL problem. One time a few months ago (I’ve been using this DNS workaround for SL for many months now) I had a strange error pertaining to the internet and my DNS settings. I cleared out the google DNS settings, rebooted, added them back, and everything worked fine again. I’m not really sure what the bug is, but it’s obviously SL related, and only newer viewers seem to have the bug. FWIW I think this is part of the reason people have been staying on Phoenix and say the newer viewers are unusable for them. If you hear about anyone else with issues with Firestorm or official LL viewer, pass on the word for this solution. I only stumbled upon it by chance, and didn’t see it documented fully anywhere so that’s why I wrote this post. 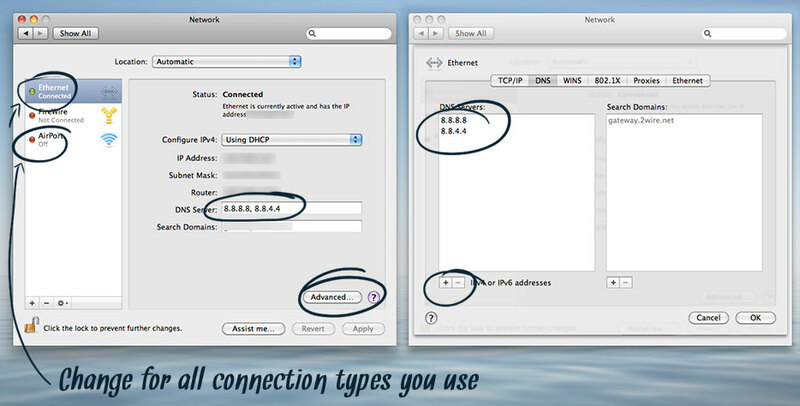 Changing your DNS settings like this might make things on an “intranet” unavailable. Fortunately, Mac OS has a nice work-around for this problem, called “Locations.” You can add a Location that has all the same network settings you usually use, except this Location uses Google DNS. Then, when you want to be in SL, you switch to the Google/SL location, and when you need to access the corporate mail server, you use the “Automatic” Location. See the Apple Support document for Locations at http://support.apple.com/kb/ht5289 for more info on creating and using Locations in Snow Leopard, Lion, and Mountain Lion. There’s a similar article for Leopard and earlier at http://support.apple.com/kb/HT2712. If you are in charge of your router at home, you can usually switch your router to use Google DNS instead of the ISP’s DNS, then you won’t have to switch locations at home. Huhuhu… mmg tough giler subjek VB tu. Seriously tak taulah apa nasib subjek IMD303 tu…. Mintak2 la lulus… Tapi ikut firasat, rasa mcm kena &#;g208ulan2kaji” balik je subjek tu… Lagi satu, paper IMD305 (Preservation) pun agak tough jugak… Anyway, dari kampus mana ni? I had problems in Mac OS X Snow Leopard, with IMs, Contact and Group lists, Avatar rezz… and with this DNS change it was fixed! Yay! Thanks everybody for the comments, I’m glad to see it’s helping people! Thank you Thank you Thank you ! and Miro Collas too for the URL. This work around fixed ALL the issues with FS Viewer I was having. OMG TY so much for a fix in simple instructions. I’m not completely computer savvy, so having a nice short & sweet fix with Mac instructions is god sent. TY TY TY TY!!!! Second Life®, SL™, Linden Lab®, WindLight® and SLurl™ are trademarks of Linden Research, Inc. QueenKellee Kuu and Royally are not affiliated with or sponsored by Linden Research. No infringement is intended.